You might have noticed I’ve not been around much for the past couple of weeks. That’s because I’ve been back in the UK visiting family and friends, as well as a six-day trip to Iceland to cross off a “Bucket List” item ….. to see the Northern Lights. I’m back home in Spain now and I’ll get to see your new blog entries and respond to your kind comments over the next few days. In keeping with the theme of this blog, and to satisfy my One Trip EVERY Month Challenge, I want to tell you about my recent visit to the Museum of Glass and Crystal in Málaga. I’ve noticed for some time on Trip Advisor that this is Number One rated attraction in the city, so it was time to pay a visit. We had spent the earlier part of the day at the wonderful Atarazanas food market, enjoying delicious tapas of fresh tuna and prawns at Marisqueria El Yerno, so it was a relatively short stroll towards Plazuela Santisimo Cristo de la Sangre to find the Glass and Crystal museum. I have to admit that it could have been a bit easier to find, but eventually we arrived after a couple of wrong turns. The Museum of Glass and Crystal is privately owned and housed in a beautifully restored 18th century building complete with inner courtyards, and displays a collection of more than 3,000 pieces of mostly European crystal and glass, as well as antique furniture and works of art. There are a number of stained glass windows from British churches, including a particularly magnificent one by William Morris. What was particularly enchanting about our visit to this museum was the fact that it is housed within a family home, and we were fortunate to be given a private guided tour by one of the owners, Professor Ian Phillips, whose knowledge and enthusiasm of this unique collection shone through. My only regret was that we had limited time available for our tour as we had to get back to our parked car, some distance away, before the meter ran out. I look forward to returning to enjoy a more leisurely tour – perhaps when our next visitors are here in the summer. Opening Hours: Tuesday to Sunday 11am – 7pm. Closed on Mondays, Christmas and New Year’s Days and for the whole of the month of August. This post is my contribution to the One Trip EVERY Month Challenge. 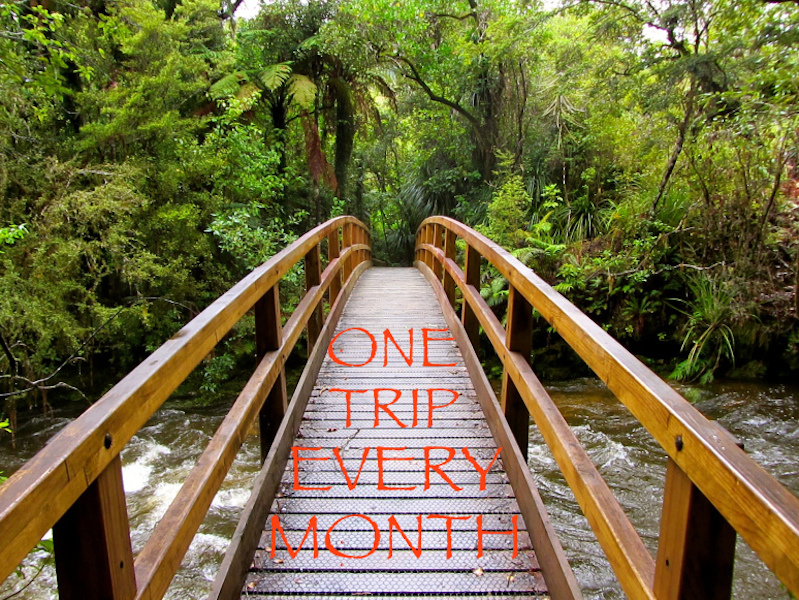 Are you ready to join me by taking ONE TRIP EVERY MONTH? What are you waiting for? This entry was tagged Andalucía, culture, East of Malaga, Europe, life, Malaga, Museums, One trip EVERY month, One trip EVERY month Challenge, photography, Religion, Spain, travel. Bookmark the permalink. Coming to Malaga in mid Nov. and this sounds like it will be a lovely place to visit. Oh Iceland and the Northern Lights! Jealous! I’d love to see them one day. I had some wonderful parking angels during our trips to the Semana Santa processions in Malaga, last week! Truly amazing! Allow yourself a couple of hours – we only had one hour inside the museum and felt we could have spent longer. Of course, it wasn’t the guide’s fault – it was our parking meter to blame! 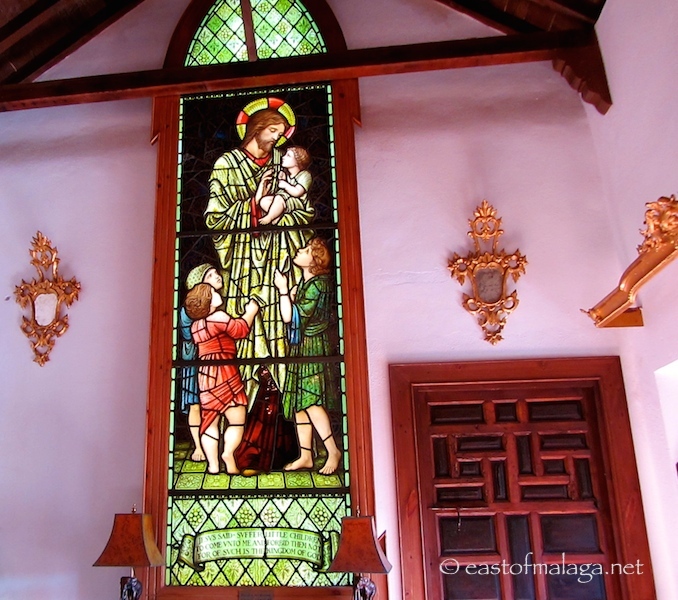 I love stained glass windows, too – particularly very colourful ones. So many beautiful sparkling colors! Love your glass museum pics, Marianne. The colours are gorgeous. What delicious looking tapas. It would go down well for lunch right now. 🙂 Looking forward to your Iceland pics. Gorgeous. I love glass. If I ever get back to Malaga, must go! 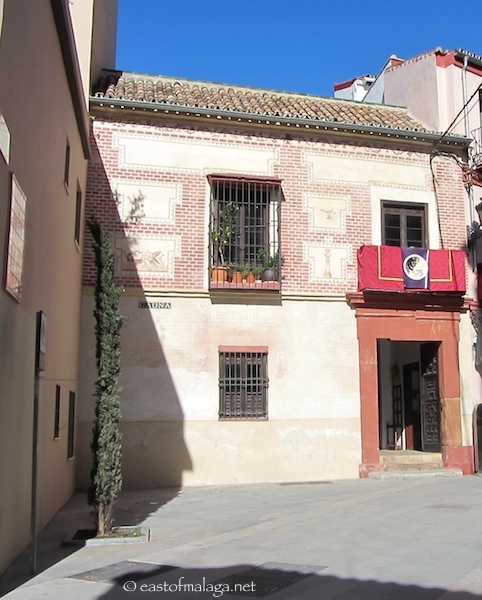 wonderful tips Marianne, I like the look of that food, we will have to find it in Malaga … and the beautiful museum … thanks for a lovely post! This museum looks heavenly! I love glass objects. Thanks for the great photos. The tapas had me drooling. A cup of tea would have been wonderful, David. English tea bags are one of the things I just have to have here – anything else is just not good enough! Iceland WAS fantastic, David – a very unusual six days – but I’m glad to be back into the warmth of southern Spain once again. Nice place to see, I like the inner courtyard. Where did you go in England? Mostly near to Gatwick airport and then a few days in the north-west of England in Lancashire. Yes, we managed to see the Northern Lights – though they weren’t as bright as on the famous Joanna Lumley programme! 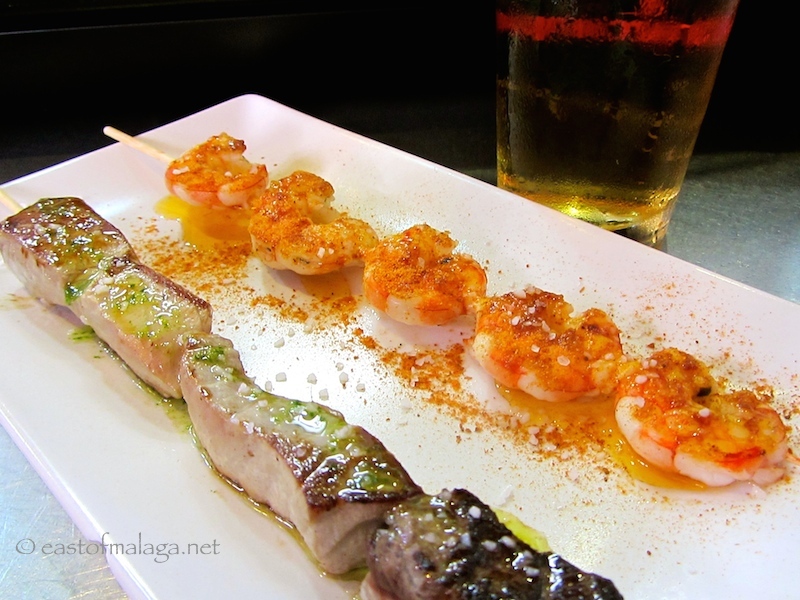 The tapas was absolutely delicious – the tuna melted in my mouth! And so is that tuna thing!!!! what a wonderful place Marianne…lucky you to see it. The museum looks lovely. We don’t visit Málaga often enough – it’s a beautiful city and there’s so much to see. You have inspired me to go more regularly. Thanks. Marianne, do you happen to know of any visits locally that would be good for my three year old grandson who is arriving on Monday. My daughter is already worrying about how to entertain him during our predicted miserable weather next week. Mmmmm …. I’m not very well informed on activities for 3 year olds, Maggie, but you could try the donkey sanctuary in Nerja, the municipal swimming pool in Competa ….or even try to find a friendly goat farm to have a look at the baby goats. A bit further away are Tivoli World or the Dolphinarium in Benalmadena or the Lobo Park to see the wolves (near Antequera). There must be some toddler groups around Cómpeta that maybe could be used for a week or two – maybe if you ask at the ambulatorio or the town hall…..? Glass is a fascinating art & craft, I am always amazed what people do with color and form in this medium. Thanks for sharing it with us. …and there were some examples in the museum that were made 2500 years ago – so yes, fascinating indeed! Thanks for your kind comment – much appreciated.